An entry in the 1561 Decima ricerca refers to a parcel of property, such as a house, a shop, or part of a structure. Each of these 8,691 items has been translated into an entry in the DECIMA database comprising sixty-six separate fields. The data contained in these fields can be divided between three headings: demographic, economic, and spatial. The 1561 Decima provides two types of demographic data: population figures and the names of owners, residents, and tenants. Bocche: At the most basic level, each entry included the number of ‘mouths’ (bocche) found on a given property, i.e. the male and female occupants. The separate figures are also found in our database as integers in the M and F fields. Bool_Inhabited: Normally, the value in this Boolean field is Y; when an entry describes a property without inhabitants, it is N. This allows users to search for, or exclude, empty residences. Each entry lists at least one name, that of the owner, and may include the names of one or several tenants and other residents. These names may be highly descriptive, including an individual’s surname, patronymic, and occupation, or abbreviated. Owner: This field lists the registered owner of the property. Tenant: If the property is held under a Lease or other long-term contract, this field contains the lessee’s name. If the property is Rented to multiple people, this will contain the name of the first renter. Resident_1, Resident_2, Resident_3: These are the heads of households actually residing on the premises; very often, the Owner or Tenant is also one of the Residents. Each name field has been subdivided into additional fields, which hidden on the map by default but available to users via the Data Query tool and on the Attribute Table. For more information on this typology, please click here. Type (Type_Own, Type_Ten, etc. ): A category field denoting whether the entity in the associated name field is either Female, Male, Hereditary, Institutional, or Ecclesiastical. Hereditary describes households identified collectively as heirs (redi) to named decedents. Institutional indicates institutions like hospitals or convents, when they appear as owners. Title and Occupation: These contain the title – ser, mona, etc. – and occupation of the associated individuals, when available. N1: Cognomen. The names of institutions are also entirely contained in the N1 field. N2: Patronymics and, in the case of widows or women identified as wives, the husband’s name. N3: Avonymics, on the rare occasions that an entry gives an individual’s grandfather’s name. N4 catches additional monikers, like toponyms, aliases, and surnames. Note: For widows or daughters identified with their husbands or fathers, the information in N2, N3, and N4 may refer to the male associate rather than the named woman. The 1561 ricerca was commissioned to gather a variety of economic information for the Florentine Decima, the department that administered direct taxes on immobile property. To that end, each entry states how the taxable value of the property in question, any revenue derived from rent listed property, and how was contractually disposed – leased, rented, etc. Value: The number in this field is the reported estimated value of the property for tax purposes, denominated in scudi. This was not the total value of the property, merely its customary annual return (7% of its official assessment). Rents: This is the revenue derived by the owner from the property’s tenants. Some properties’ rents were provided in lire, others in scudi, and some in both currencies. Accordingly, this field has two subfields, Rents_scudi and Rents_lire, which together provide the total reported rent. Contract_Main: This is the primary arrangement under which the property was occupied. For example, a property might have been Rented by the owner to a tenant, let out under a Term Lease, or occupied by the owner her- or himself (Owner Occupied). Bool_Sublet: In most cases, the value in this field is N. If the property was sublet by the lessee/tenant to other parties, the value in this field will be Y.
Contract_Sub: In case the property was sublet, this field contains the secondary arrangement under which the primary occupant or tenant devolved the property onto other residents. For more information on contracts versus actual residency in cases of subleases, please click here. The contractual arrangements found in the 1561 ricerca are separate from physical residency. Some owners and tenants did not physically reside on the property in question, while others did. In every case, the Resident name fields aim to reflect the heads of household actually living on the property in question. For example, an owner may have lived in a property but also rented out part of it. In such a case: Contract_Main = Owner Occupied, Contract_Sub = Rented. The Owner will reappear as Resident_1, and Resident_2 will be the renter. Tenants, too, were sometimes resident on the property alongside others to whom they sublet. The following field helps remove ambiguity in these cases. Bool_TenisRen1: To quickly note a tenant’s residency in cases of subleases, users can check this field. If the value in this field is Y, the Tenant will also be Resident_1 on the property; if the value is N, the Tenant was a non-resident. For more information on the contract types found in the 1561 Decima, please click here. There are a number of different contract types found in the Contract_Main and Contract_Sub fields, each of which simplifies and summarizes a set of contracts described in the 1561 ricerca. Owner Occupied: This value indicates that the head of household listed in the Owner field was resident on the property. Rented: This value indicates that the residents owed rent (pigione). Lease: This term is used to indicate a long-term tenancy contract, characterized by a lump initial payment and an annual rent (lower, on average, than the expected pigione). Unfortunately, the length and entry costs of these leases are not found in the 1561 ricerca. Term Lease: This phrase denotes all properties with a normal lease (livello). Life Lease: Life leases were functional annuities, customarily lasting as long as the tenant’s lifetime (a sua vita). Some of these were extended to the widow or children of the tenant. Lineal Lease: Lineal leases adhered to a single patriline (a linea masculina or, simply, a linea), whose members held the rights of tenancy in descent. Held by Service: A mixed category, denoting contracts within which the tenant or resident owed some form of service (per officio). A few entries, for example, describes a baker holding an oven from a convent in exchange for baking its bread (e.g. SG #49). Held without Payment: This indicates cases in which the tenant or residents owed nothing for their rights (senza pagamento); some of these specify that the tenant was a family member, others noting that the room was free “for love of God” (per amore di Dio). Unknown: This value indicates that the document provides too little information to categorize the contract type. In some cases, that section of the entry was blank. Other: There are a wide variety of holding types found in the 1561 ricerca, and not all of them can be categorized. When a user encounters this value, they should direct themselves to the Holding_Type, Bldg_Info, Loc_Info, and Notes fields. The unedited transcriptions and comments in these fields will usually clarify the contract, but feel free to contact us if any further guidance is needed. Quarter: The quarter of the city (S. Croce, S. Maria Novella, S. Giovanni, S. Spirito) within which this property existed. Street: The name of the street along which the property is situated. Besides these basic features, the DECIMA Project presents the spatial data of the 1561 ricerca via the ArcOnline app available to users via this site. Accordingly, each entry has been assigned Latitude and Longitude based on the projection created by the DECIMA team using evidence from the original documents. For a detailed explanation of our methodology, please click here. Our model of 1561 Florence is a streetscape that has been reconstructed on the basis of the Decima ricerca. The locations of each property are abstracted from our available data, but we have aimed to ensure that each has been accurately localized to the appropriate block and in the appropriate order – i.e., we can be fairly sure that SMN #15 is the fifteenth property from the west along the north side of the Piazza di Prato. In crafting our map, we were reliant on the census-takers’ periodic updates about their current location, which appear in the text of entries at irregular intervals, as well as their generally scrupulous description of contiguous properties (by the owners’ names). 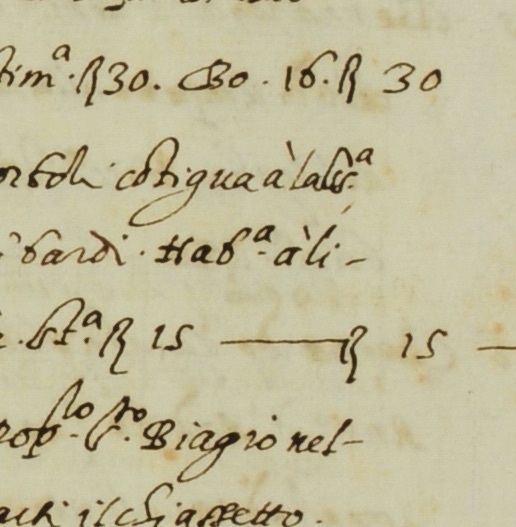 The ricerca almost always lists when the magistrates reached a corner (canto) and the names of adjacent streets. If property J is adjacent to property A, we have completed a chain. Even if property C happens to be missing from the census for some reason (it might be a church, for example), we can still reconstruct this circuit. Adding in the street names, we can be fairly certain about the route taken by the census-takers, and therefore the location of the properties in Florence. Thankfully, the magistrates almost always operated along these lines, completing whole blocks in sequence. It is their eccentric methodology that has permitted the near-total reconstruction available in our app. Most of this kind of information is available in the Loc_Info field. Although the data in this field is difficult to standardize and query, users are invited to check our work and familiarize themselves with the basis of the spatialized 1561 ricerca.